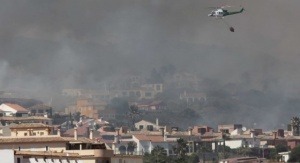 Fires in La Linea de la Concepcion and San Roque forced to evacuate 545 people from houses, hotels and campsites nearby. The evacuations have affected the urbanisation of Santa Margarita and La Alcaidesa. 420 tourists were evacuated from an hotel establishment in Alcaidesa. The fire declared in San Roque forced the evacuation of120 people, mostly children, during the early hours of Wednesday. It has also burned a restaurant and some houses. Forest fires are increasingly affecting populations surrounded with forest areas, which is called wildland-urban interface. It affects hundreds of homes, but also hotels, camping, cottages, etc. The Fire Protection Forum in wildland-urban interface (public and private organizations) is working on the development of recommendations and techniques and standards to achieve joint legislation building and city planning guides. We would like to remind you the minimum security measures that TECNIFUEGO-AESPI recommends for neighborhoods in a wildland-urban interface.